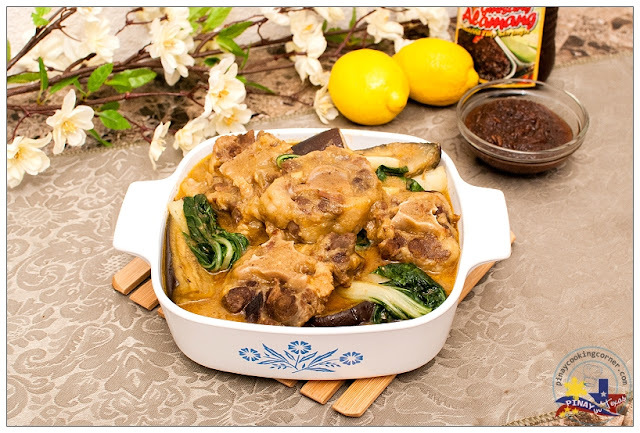 For those of you who don't know what Kare-Kare is, it is an authentic Filipino stew traditionally made of oxtail cooked with vegetables like string beans, pechay, eggplant and puso ng saging(banana bud), with a sauce flavored and thickened with ground roasted peanuts and toasted rice flour, and usually served with bagoong alamang (shrimp paste). 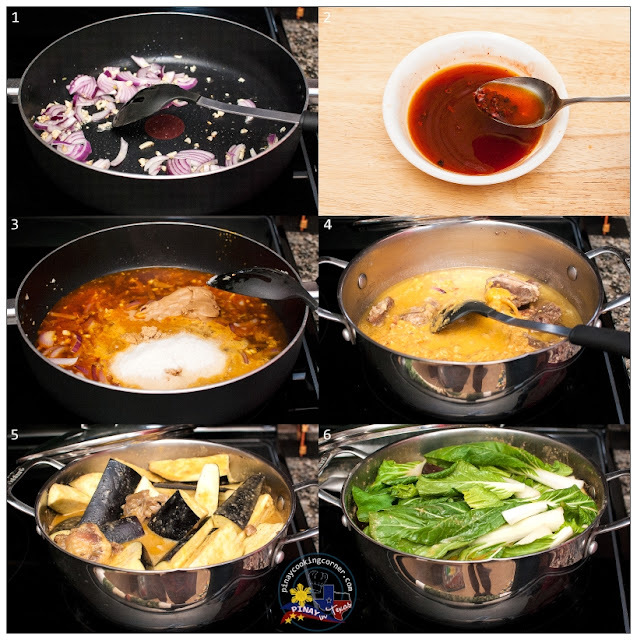 Tripe, beef, goat meat or pork leg can also be used as substitute for oxtail. 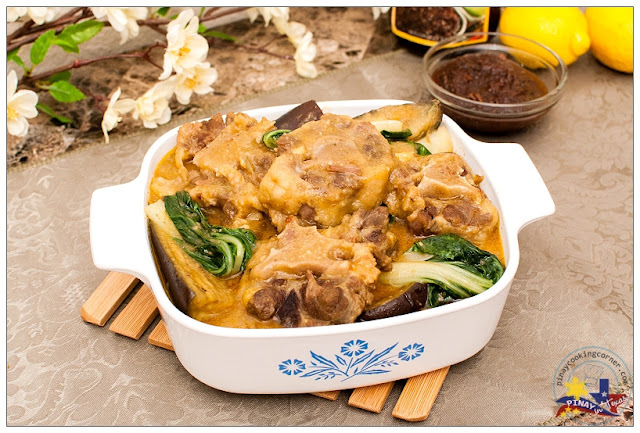 Today, let me share with you my version of Oxtail Kare-Kare...I didn't have string beans and banana bud so eggplant and pechay are the only vegetables in this recipe. But I tell yah, this is really good despite the missing ingredients! Check it out! 1. 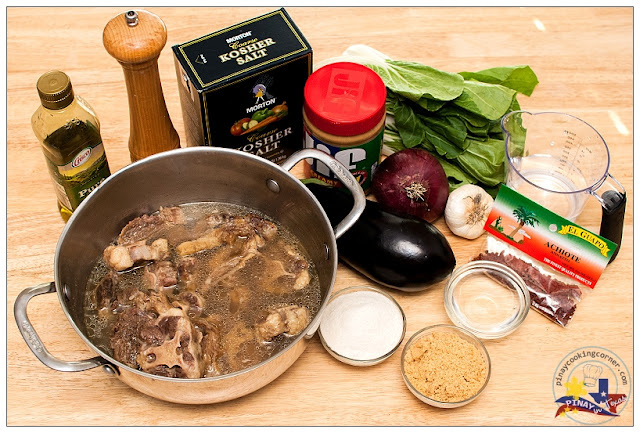 Place oxtail in a pot. Add enough water to cover the meat and bring to a boil over medium heat until scum appears on the surface. Remove all the scum or brown bubbles that will form on top of the soup. Replace water and bring to a boil again. Add 1/2 Tbsp salt and 1/4 tsp pepper. Cover and simmer until tender, approximately 1½ - 2 hours. Test for tenderness. Add more water if necessary, i.e., if it has to be cooked longer. Remove extra broth from saucepan. Just keep about 3 cups. 2. In a skillet, sauté garlic and onion in oil until onion is almost translucent. Remove achuete from the water and discard. Pour achuete water and 1 cup water into the skillet and bring to a slight boil. Add ground peanuts, toasted rice and peanut butter. Mix until well combined. Pour into the saucepan with broth and oxtail. Simmer for 5 minutes, stirring occasionally. Add eggplant and simmer for 10 minutes or until eggplant is cooked. Add pechay and simmer for 3 more minutes. 3. Remove from heat. Serve hot with rice and shrimp paste with a sprinkle of lemon. Looks like delicious side for rice. Awesome dish with oxtail...like all the veggies in it. Ok, firstly I will opt for goat or lamb meat. Next I will follow as per your recipe because the flavors are very fabulous. It's also good to try other dishes from other ethnic group because that's when eating becomes interesting.